In Hokhold v. Gerbrandt, 2016 BCCA 5, Court of Appeal Registrar Outerbridge tackled the appropriate treatment of outsourced legal work when assessing costs. 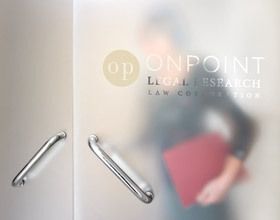 The decision confirms that OnPoint Legal Research provides much more than just research to its clients and that, by delegating to OnPoint, lawyers are able to attain appropriate and reasonable legal fees for their clients. The appellant, Mr. Hokhold, was a self-represented litigant in a contentious family law appeal. Larry Kahn, QC, an experienced family law litigator, represented the respondent, Ms. Gerbrandt. In the course of the appeal preparations, Mr. Hokhold continued to breach court orders, leading the court to dismiss his appeal after significant expense had been incurred by Ms. Gerbrandt. The court awarded Ms. Gerbrandt increased costs, to be assessed by the Registrar. Registrar Outerbridge set the increased costs at 42.5% of Ms. Gerbrandt’s actual legal costs. While these legal costs obviously included Mr. Kahn’s own fees, it raised the question of how to treat fees for outsourced legal work. As he often does, Mr. Kahn hired OnPoint Legal Research to perform some of the appeal work. This included factum drafting and preparation of the appeal books. Mr. Kahn explained that he used OnPoint at least in part because OnPoint lawyers, who have little to no overhead, bill out at a lower hourly rate than associates, thus saving his client legal fees. As an aside, Mr. Kahn reasonably bills OnPoint’s fees to his clients at rates commensurate with those of his own firm’s associates so as to fairly profit on the OnPoint work that he adopts for his files. As such, the OnPoint rates that were listed on the bills before Registrar Outerbridge were actually higher than those charged by OnPoint to its clients. Even with this markup, Registrar Outerbridge still determined that the fees were at or below market rates. A review of the bill shows the work done was far more than simply legal research. Entries for OnPoint’s lawyers included review of correspondence, preparation of the appeal book, revision of the factum, conferences and emails, as well as the preparation of affidavit material. Though such activities often complement research done, they are services that might otherwise be provided by an associate lawyer. As OnPoint’s services were essentially those of an associate, Registrar Outerbridge held that OnPoint’s fees should be treated in the same fashion as associate fees when assessing costs. In the context of increased or special costs, this means the entire bill should be included in the calculation of a cost award before applying any applicable reduction. Registrar Outerbridge also recognized the importance of delegating work to outside lawyers as a manner of limiting legal fees. As Registrar Outerbridge noted, OnPoint’s hourly rates are at or below market rates for lawyers with similar levels of experience. Accordingly, Registrar Outerbridge concluded that Mr. Kahn’s decision to hire OnPoint was an example of “appropriately delegated” work that cut down legal fees. This in turn assisted in demonstrating that the overall bill was reasonable. Gerbrandt demonstrates the value of hiring OnPoint to help with your files. OnPoint’s fees are below the market rate for comparable associates, and OnPoint’s services run the full range of what you expect from any experienced lawyer at your firm. This not only saves your clients money, but also can support you in defending the reasonableness of your bill. Gerbrandt confirms that delegating work, whether it’s researching a legal issue or drafting a factum, can demonstrate that a lawyer is taking steps to keep costs within reason.